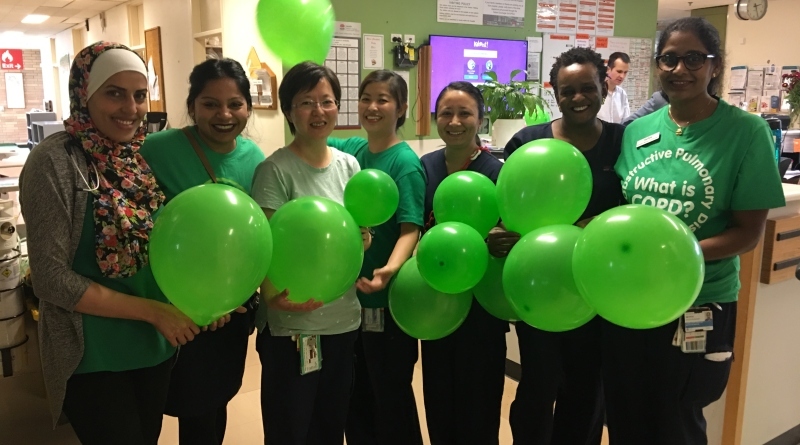 Medical staff at Westmead Hospital are raising awareness of COPD. The condition causes narrowing of the bronchial tubes in the lungs (sometimes called bronchi or airways) and this makes it difficult to breathe. While COPD is a progressive and (currently) incurable disease, with the right diagnosis and treatment there are many things you can do to manage your condition and breathe better. People can live for many years with COPD and still enjoy a good quality of life. It is estimated that it impacts almost 1.5 million people across Australia. The main risk factor for developing COPD is tobacco smoking. Western Sydney Local Health District clinical nurse consultant, Vinita Swami said COPD represents an important public health challenge. Nursing staff from ward B5A/C raised awareness of the condition during world COPD day recently by holding an afternoon tea and playing an online quiz. The aim was to improve knowledge about COPD to assist clinicians in delivering evidence based care and in turn empower patients to manage their chronic illness better. COPD is not curable but it can be more effectively treated if it is diagnosed early.